Thank you to everyone that has visited us so far this shop hop. It is great seeing all the friendly faces every year. We started with a blinding snow storm on the first day-but that didn't stop the dedicated hoppers. This is a shot of the finished quilt Ta-Dot. It was a lot of fun to make and we have gotten rave comments about it. It's not to late to start hopping-we run through April 19th. Our Shop Hop contract does not allow us to have sales in the shop during the hop-so we are offering 20% on our online orders. A great time to pick up all those little items you have been admiring. This will run through April 19, 2015. 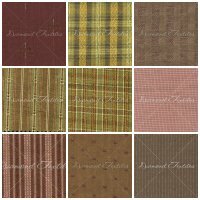 We received another shipment of these wonderful homespun fabrics from Diamond Textiles. The colors are warm and rich and the texture is out of this word. We will be offering a two day workshop with certified Judy Niemeyer Instructor-Catheryn Erickson. 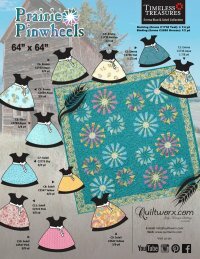 We have chosen the pattern Prairie Pinwheels. This pattern lends itself to so many different looks. 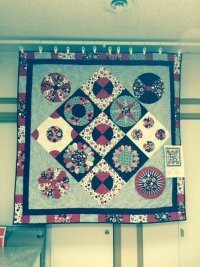 Done in dark prairie fabrics and the quilt is perfect for country decorating. Mix up some bright fabrics and you have a perfectly modern look. The possibilities are endless. Learn to paper piece-or take your skills to the next level with this class. You will spend 2 full days honing your skills and playing with fabric! Cost $130 per person and includes your pattern. 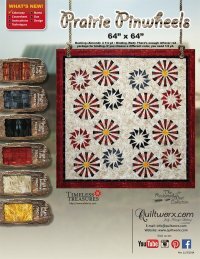 The plans also include a trunk show of the beautiful quilts created using Judy Niemeyer patterns on June 11. The show is sponsored by the Heartlands' Quilter Group and will be held at 7 pm at McKinley Education Center.